One reason that many people know of Arunachala is through the great Sage, Bhagavan Sri Ramana Maharshi, who resided on Arunachala and in Tiruvannamalai from 1896 to his passing in 1950. Once he arrived at Arunachala he lever left. Here are a few verses from his “Martial Garland of Letters,” speaking of his love for and devotion to Arunachala. 47. Let me dive into the true Self, wherein merge only the pure in mind and speech, Oh Arunachala! 48. When I took shelter under Thee as my One God, Thou didst destroy me altogether, Oh Arunachala! 49. Treasure of benign and holy Grace, found without seeking, steady my wandering mind, Oh Arunachala! May the grace of Arunachala fill your heart. The “Inner Path” of Arunachala is a place of silent beauty and deep peace. Arunachala and the Inner Path are shown in great detail throughout this blog. This includes detailed descriptions and photo essays for each section of the Inner Path, as well as places that are rarely visited. 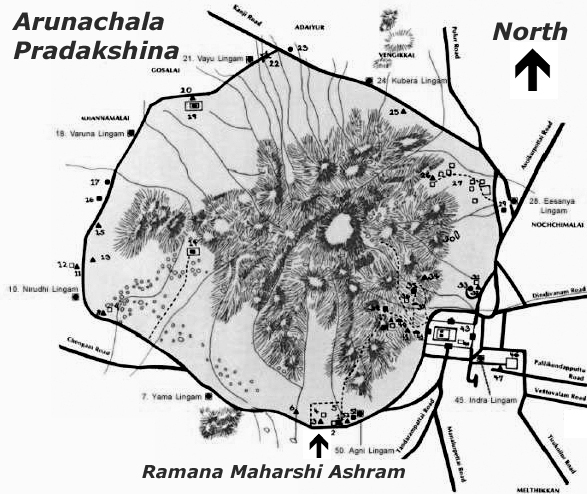 The new “Yellow Path” is shown as well as other articles about Arunachala’s original Inner Path. Maps developed for this blog are also presented to assist readers who want to visit these special places of Arunachala. Click here to see the Guide to the Inner Path. Note: Starting in July of 2012 the Forest Department first limited access to, then banned use of the Inner Path. This seems like a tragedy for many devotees of Sri Ramana Maharshi who have used this path for years and still use it regularly. There are fines for violation of this ban. Efforts have been made since the days of Ramana Maharshi to protect and preserve Arunachala, This page shows many stories about this effort. The “Outer Path” is the Pradakshina path that was most used by Sri Ramana Maharshi during his lifetime. It is now the route that is most used by the millions of people who visit Tiruvannamalai each year to take in the spiritual glory that is Arunachala. A key part of this is to walk Pradakshina (“Girivalam” in Tamil) around Arunachala. Click here to see the Guide to the Outer Path. There are more than 100 temples and shrines alone the Pradakshina route. Most of them can be seen here. Click this link to see Temples and Shrines along Arunachala’s Outer Path. Caves of Arunachala provides details on 30 caves we have found on and around Arunachala. Arunachala – On the Top shows the view from the top of Arunachala. Dawn Over Arunachala shows glorious sunrises over Arunachala. Leopards Return to Arunachala is a story of successful environmental reconstruction over the last 20 years. Planting Trees Around Arunachala details some current efforts to restore the forests of Arunachala. Flowers of Arunachala shows some of the many flowers that bloom on and around Arunachala. More Flowers of Arunachala shows some additional blooms not covered above. This entry was posted on October 25, 2011 at 12:10 pm and is filed under Arunachala, Pradakshina, Temples, Shrines and Ashrams, Tiruvannamalai. You can follow any responses to this entry through the RSS 2.0 feed. You can leave a response, or trackback from your own site. I’ve a page in facebook (facebook.com/tvmalai). We are conducting a online photography event in association with Rotaract Club of Thiruvannamalai (Youth club of Rotary). We like to honor your work in our Rotaract meeting. Please let us know your availability in Thiruvannamalai. So that we will arrange a meeting to honor your work.